Losing your teeth changes more than just your appearance. It makes day-to-day life difficult and even jeopardizes your health. Missing teeth can change the way you look and even the way you feel. Are you hiding your smile because of tooth loss? Trying to eat with damaged or missing teeth can be painful and sometimes impossible. Are you limiting your diet due to oral health issues? Dentures can enable normal eating habits, promote a strong jawbone, and restore a happy and healthy smile. Don’t live life without a complete smile any longer. Contact us to schedule your denture consultation today! What Kinds of Dentures are Available to Me? We offer traditional, custom, and implant supported dentures. Traditional full dentures are a good choice if you’re missing all or most of your upper or lower teeth. Partial dentures are right for patients who are missing just a few teeth from either arch. Either of these traditional options are natural-looking and conveniently removable. Custom dentures are a good option for patients who want their dentures to look flawless. Custom dentures are designed based on your exact preferences regarding color, size, and shape. We will make adjustments as necessary until you are happy with the results. Denture implants incorporate dental implants to better support full or partial dentures. We offer strong titanium implants that will improve your jawbone health and ensure a secure smile. We hope our patients are pleased with our state-of-the-art dental implants center here at Martin Dental. First, schedule your consultation with Dr. Martin to discuss your needs and begin formulating a treatment plan. We can pretreat your smile by removing any remaining damaged teeth in a comfortable extraction process. 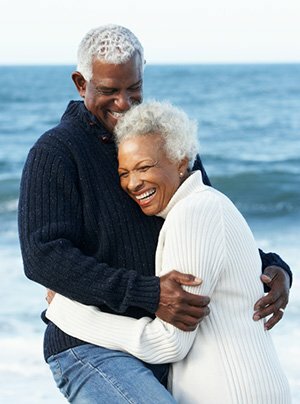 Finally, we will design and place your beautiful dentures, so you can walk out of our doors with confidence. Schedule your appointment to recreate your full and complete smile at Martin Dental today.